1STOP AUTO SHOP is locally owned and operated with roots that run deep in Oklahoma. Our commitment is to provide you with the best customer service and quality work at an affordable price. Whether we are replacing wiper fluid or an entire engine our technicians take special care so that the job is done right the first time. We work with insurance companies to make sure you get the most for your claim. Our work is guaranteed and we will be here long after the other guys have left town. 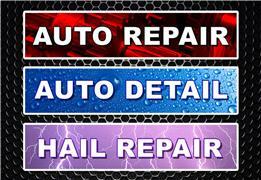 The best way to get your vehicle looking like new is with our auto detailing service.